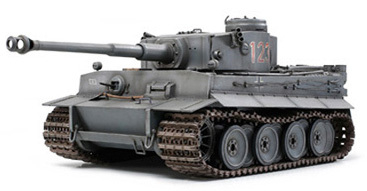 1/25 German Tiger I Model Tank Kit Discounts Apply ! TAM30611 - 1/25 German Tiger I model tank kit. Back by popular demand after a long 12 year wait, Tamiya is proud to re-release the 1/25 German Panzer kampfwagen VI Tiger I display tank model. Discontinued items by Tamiya. This is a re-release of the 1/25 scale display kit first released in 1969. Highly detailed areas such as the breech and the basket inside the turret, and drivers position, feature some of the 300 plus parts which provide the model with its impressiveaura. Torsion bar type suspension is movable. Connectable assembly type tracks add greater realism to the model. Commander, loader, and driver figures included.